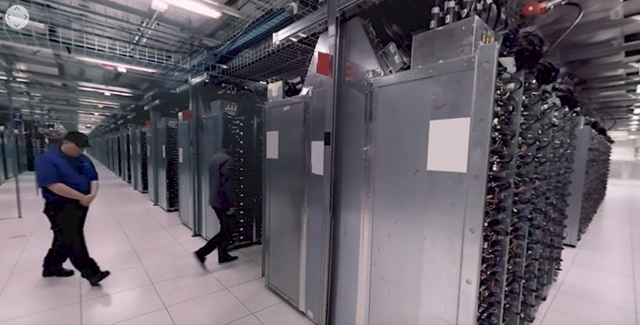 The tour shows off some of the industry's most advanced data storage and retention hardware, not to mention the security and support systems that are put in place to keep everything running smoothly. In addition to the standard enormous server farms and gigantic cooling systems, there are a few parts of the facility you might not have thought about, like an industrial shredder that destroys failed hard drives and SSDs to avoid the possibility of stolen data. Google's tour is available in 360 degrees on the web, and in 4K resolution no less. But in order to really get the most out of that hot, steamy data center action, you need to open the video on your phone and slip it into a Cardboard headset or something compatible. That way you can pretend you're right there alongside the host as he goes through the security measures, server room, coolant plant, external evaporation cooling towers, and a dedicated power substation. Now excuse me, I'll be in my bunk.